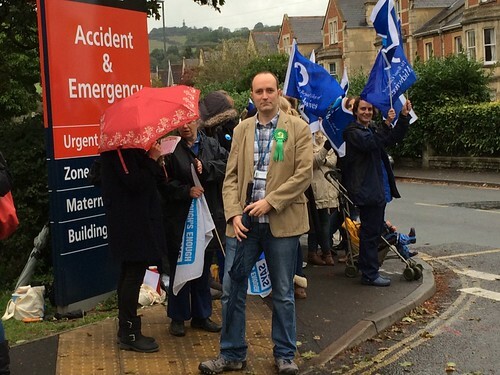 This morning I was at the Royal United Hospital in Bath, supporting the striking midwives and other staff. Despite the weather it was a great turnout, with a good atmosphere with plenty of support from passing motorists. This was the first strike of NHS staff for thirty years, and the first ever strike of midwives called by the RCM in its 133 year history. Along with members of Unison, Unite, GMB, UCATT, around 400,000 health care workers are taking action. Much as the Right like to portray public sector workers as ‘downing tools’ every five minutes, the fact that it has been 30 years since an NHS strike shows that to be an incorrect stereotype. It is clear, therefore, that NHS staff must have a very serious issue. And indeed they do - most have suffered a real-terms pay cut over the duration of this parliament. There was a glimmer of hope for them when the NHS independent pay review panel recommended a 1% rise. That’s 1% - hardly an enormous amount after years of a pay freeze, but it was something. The government then declared that this pay rise was ‘unaffordable’ and stated that it would not be awarded on top of increments. This is, of course, nonsense - the money required is a tiny percentage of the NHS budget, but more importantly, if tax cuts for higher rate tax payers are affordable, the first thing we should be doing is making sure that those we depend on to save lives aren’t paid less now in real terms than they were five years ago. And make no mistake, a lot of NHS workers are not paid well - a nurse starts on £21,300, which is below the average graduate salary. They are then expected to work long hours for nothing. Notice the panic at the union’s announcement that their staff are going to ‘work to rule’, or in other words, do what they are paid to do. This should be what everyone does anyway, rather than the government relying on the good will of NHS staff to cover shortfalls in staffing on their own time. So there’s the pay, but of course that’s on top of the Coalition Government’s massively disruptive NHS reorganisation and privatisation. Billions have been spent on breaking the NHS up into little pieces that are easier to sell, and indeed, many services have been sold off - 70% of NHS contracts have gone to the private sector. The destruction of the old NHS structure that was required to enable this has led to staff not knowing whether they will have a job in a year’s time, or if they do, what they’ll be doing and where they’ll be doing it. It is a costly farce that is costing lives of patients, and even the Tories have admitted that its the single worst thing they’ve done. If you’re told about a lack of funds in the NHS preventing staff getting a pay rise, remember that we spend £30bn just to allow private companies to take NHS money. I am proud to stand with NHS staff and their demand for the very small recommended increase. It’s not much. They save lives. Did the MPs reject their 9% increase? No.